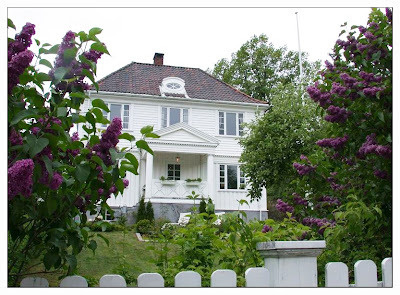 This beautiful house can be found near the Monolith in the Vigeland Park. Isn't it just beautiful?! Another building from the Majorstua area. I just love these brick buildings with the beautiful colours and details. If I had to live downtown, I'd love to live in one of these. 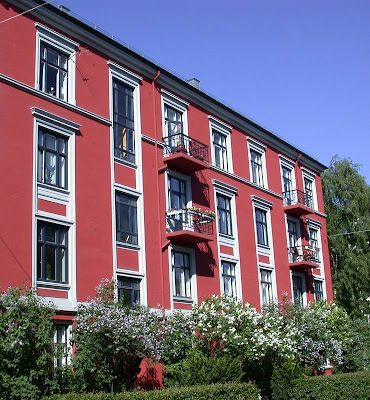 This is a building in the Majorstua area, close to the center. There are a lot of really nice buildings in this area. I will post more later. 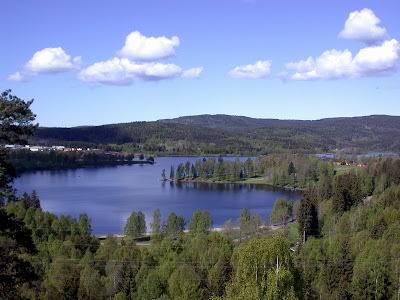 This is the Bogstad lake, a beautiful area west in Oslo. Translated it means something like "marshy place lake". The yellow buildings you can barely see to the right, are Bogstad Estate from the 16th Century. It's a beautiful place which I will visit soon to get more close up-photos. They have a cafe and guided tours of the estate. They also have some animals there, and an art exhibition. This is an excellent place to take the family on a Sunday. To the left (not visible in this photo) there is a nice spot for playing golf. Close by is a large, all year open camping spot; the Bogstad camping. Here's a close up of the Estate, but I'll return with better photos later. 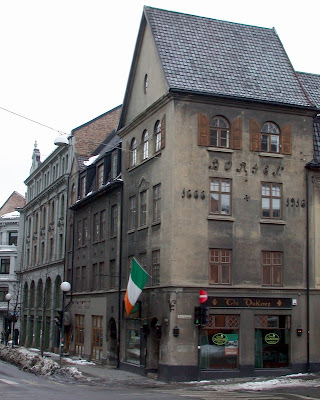 This is an Irish pub in Oslo: The Dubliner. It's located in downtown Oslo and is my favourite place to go out. Always great atmosphere, good bands and lots of fun people. I love meeting people from the UK, and this is the place they go. :) The building is quite old, I think, and looks kind of scary in this photo. But it's very nice inside! I spent yesterday here, it was a grand night! This photo is taken by my guest blogger, Stormel. This is a typical spring sign: Kids parking their bikes outside their school. 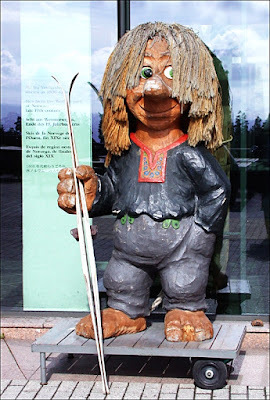 This little fellow is standing outside of the ski museum at the Holmenkollen ski jump. He looks quite happy and content. I guess he enjoys all the tourists taking photos of him. Trolls are mythic creatures from the Norwegian folk tales. They usually live in the deep forests, inside mountains or under a bridge. According to the fairy tales, trolls don't like sunlight. In fact, if the sunrays hit them, they'll turn into stone. One day Askeladden and his two older brothers were out in the forrest, they met the Troll. This troll was not a good one, and it caught the three brothers and brought them to his cage. Askeladden realized that they would all be eaten the next day. But he would try to fool the troll. "Let's have a competition", said Askeladden to the troll. "If I can eat more of that porridge than you, then you will set us free." The troll thought this boy was very funny. How could this little boy eat more than him? But the troll agreed to the terms, and they started eating. After they had finished the first bowl, the troll was very surprised that Askeladden still seemed hungry. What the troll didn't know was that Askeladden had his bag inside his sweater and that he used this bag to put the food in. "Why don't we bring another bowl of porridge on", said Askeladden, but now the troll was starting to get full. After a while the troll said to Askeladden that he could not eat any more. Nor could Askeladden, so he suggests to the troll that the can cut their belly open with a knife. The troll may be stupid, but not that stupid, and he laughs and says that he will do it if Askeladden does it first. Of course Askeladden just cuts his bag, while the troll, who really don't want to lose the competition, cuts his belly. After the troll is dead, Askeladden releases his brothers, and takes all the gold in the trolls cave with him back home. For a more modern version of another fairytale (Little Red Riding Hood), check out the link in the menu to the right - under Norwegian comedy. 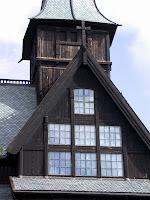 This is Holmenkollen chapel, a small church stituated quite near the Holmenkollen ski jump that I've showed you earlier. The chapel was built in 1903. It's famous because it's often visited by the royal family. In 1992 it was set on fire (probably by a self-declared satanist) and it was completely destroyed. After some years a big fund had been raised and the chapel was rebuilt in 1996, quite similar to the old chapel. 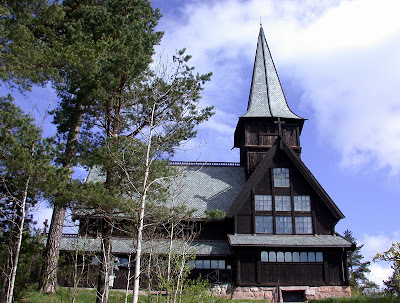 It's inspired by the old stave churches. Something cool I just found on a map service online. Here you can see a 360' panorama photo from Holmenkollen, showing the church, the view over the city and fjord and of the ski jump. I hope you'll enjoy it! Underneath you'll find a similar panorama of the ski jump (it's even better) and also the other Norwegian cities/places they've added panorama photos from. Here's a closer look at the chapel. Click to enlarge. By the way, I recommend a blog named The Jeremy & Christine wild in Oslo Tour 2007. They travelled just recentely from America to Norway and has written a lot about their experiences here. It's quite funny and has lots of cool photos. It's quite easy to get around in Oslo without a car. 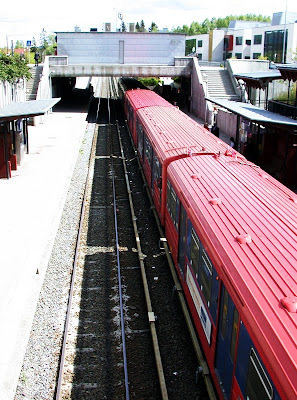 There are lots of busses, trams - and the subway, which doesn't only go underground. 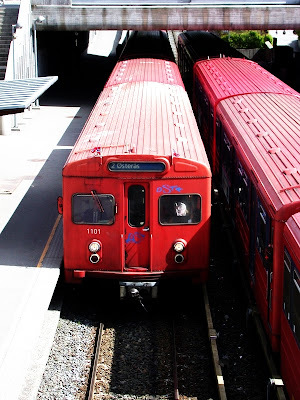 These can take you either downtown, out of Oslo or to the opposite side of Oslo. Usually, they go every 15 minutes, which is quite good. In the weekend you can find night busses to get you home in a less expencive way than by taxi. This photo is taken by my sister. 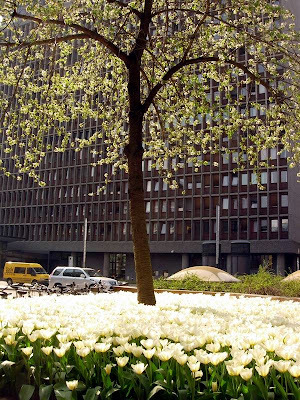 It's an "ocean" of white tulips outside the "Government block", i.e. the government's office building, in downtown Oslo. Lovely, isn't it? This is very typical for Norway: Vaffel. It's a type of sweet I like a lot, mainly because it isn't too sweet (or at least it doesn't have to be). It can be made with a lot of different ingrediants, but it usually contains eggs, sugar, flour, milk and some fat (melted butter). You can add cream, sour cream or curdled milk to give it a different and richer taste. The batter resembles the one you use to make pancakes, only thicker. 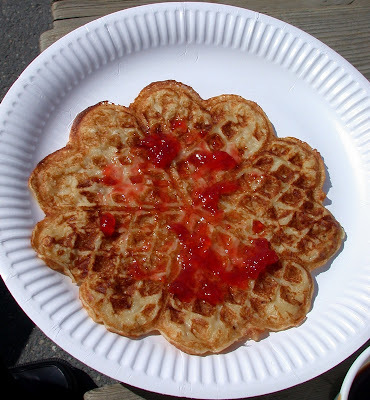 You bake them in a special waffle iron which gives it the special checker work and the heart shape. This one is covered with strawberry jam and ready to be eaten. I love waffles with sour cream and a little blueberry jam, or just butter and goat cheese. 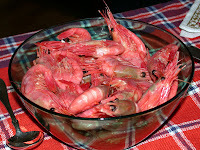 When we celebrate May 17th, Norwegians like to eat well. 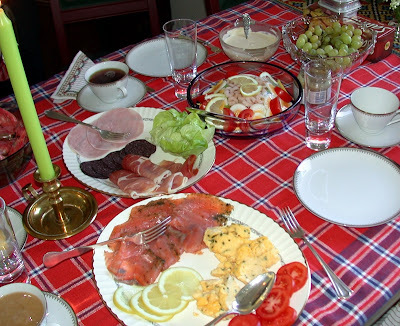 This is a typical lunch table with smoked salmon, scrambled eggs, vegetables and ham. What you also can see here is something we call "kabaret" or hors d'oeuvres. It's vegetables, pieces of fish and shrimps and eggs in aspic-jelly. Not my favourite, but it's okay. 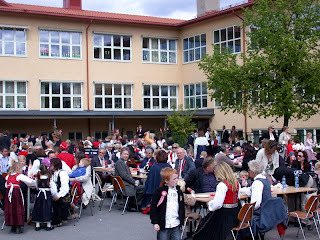 This photo is from a Oslo school where a lot of people gathered after the big children's parade downtown. It's common that people return to the schools of their children. There are cakes and ice cream for sale, and lots of fun games to play for the kids. You meet the parents of your children's classmates and just enjoy seeing all those people dressed up nicely. We stayed there for a couple of hours before we went to on to visit some family. I didn't get a chance to take pictures of the children's parade, but if you visit this photo series you'll get a nice look at how May 17th were celebrated yesterday. 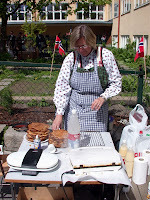 The first photos are from Oslo, but there are also photos from other parts of the country. 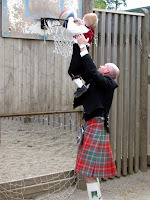 I even found a guy in a Scottish kilt. So cool! His young son, however, is wearing the traditional Norwegian bunad. Greetings all my DP-friends! Today Norway celebrates it's "birthday" - it's Constitution Day. 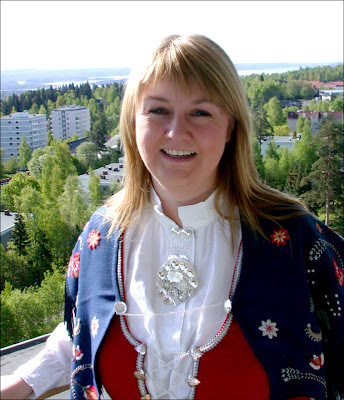 I am wearing my bunad from Rogaland (western Norway). It's one of the many national costumes we have. Very soon many children and music bands/brass bands will gather in a huge parade downtown. 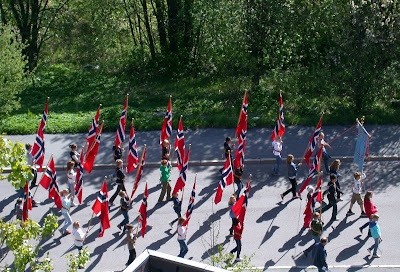 Norwegians who live abroad usually celebrate this day in the country they're staying - so you might see a parade where you live as well. I will take a lot of photos today and show you later. 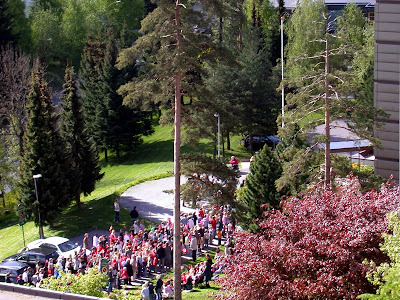 Tomorrow is May 17th; Norway's National Day. Everybody has the day off school (and work) to celebrate all over the country. 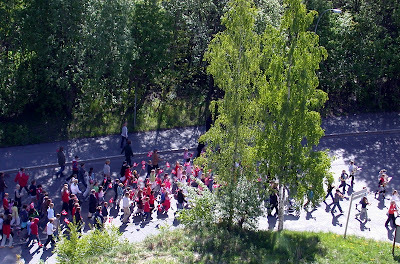 It is custom on the day before that schools and preschools march together in a parade with huge flags, school bands and children waving flags. This parade just passed where I live. They were on their way to a home for elderlies where they play, sing and cheer. It's usually very appreciated by everyone. This is a close-up of the top of the Monolith in the Vigeland Park (see post from yesterday). I think it's really fascinating! The column, 14.12 meters (46 feet) high carved out of a single block of stone, consists of 121 figures. 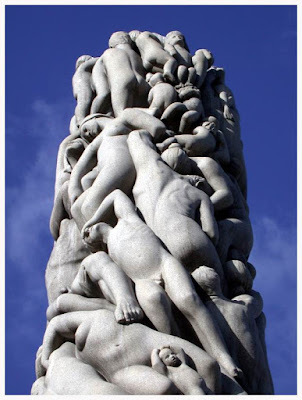 Modeled by Vigeland in the years 1924-25, it took three stone carvers from 1929 to 1943 to complete the Monolith, just shortly before Vigeland died. The column is completely covered by human figures in relief, singly or in groups. At the bottom there are seemingly inert bodies. Above them figures ascent in a spiral, the movement halting midway and then rising at a fast pace towards the summit which is covered by small children. Various interpretations of the Monolith have been suggested: Man's resurrection, the struggle for existence, Man's yearning for for spiritual spheres, the transcendence of everyday life and cyclic repetition. The monolith is situated on a plataeu, surrounded by 36 groups of granite sculptures of Man in various situations of life. This is definitely my favourite area of the Vigeland Park. 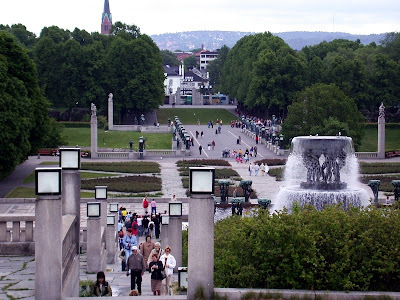 This is one of the main tourist attractions of Oslo - The Vigeland Park, or Frognerparken as we usually call it. I love this park and the sculptures. 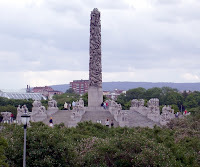 Here you can find the Monolith, the little angry boy (Sinnataggen) and all the other fantastic work by Gustav Vigeland. If you ever visit Oslo, this really is the one place you just got to visit! THE VIGELAND PARK covers an area of 80 acres. The 212 sculptures are all modelled in full size by Gustav Vigeland. He also designed the architectural setting and the layout of the grounds. The sculptures are placed on an 850 metre long axis divided into 5 main units: Main Entrance, The Bridge with the children's playground, The Fountain, The Monolith Plateau and The Wheel of Life. Click here to read more and to see a video presentation. This photo is really cool, I think. And I can say that, because it's not mine. 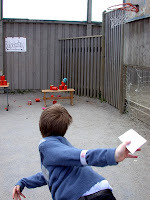 This is my dear guest blogger Stormel's photo. I'm really happy she can help me with photos because I can't easily get around as much. 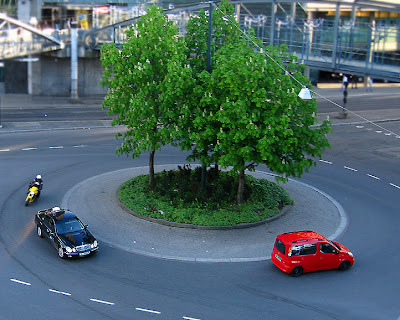 This is a roundabout situated near the railway station in Oslo. 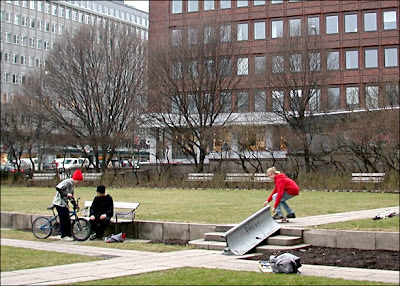 The bridges above the roundabout can take you from the railway station to the shopping mall "Oslo City". Close by is also the "Oslo Spektrum Arena" where they have concerts, shows and trade fairs. 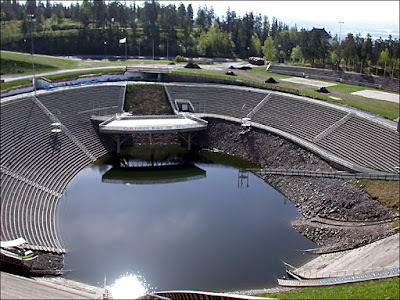 This is also the arena for such events as the Nobel Concert, Nordic Music Awards, the Spellemannsprisen (the Norwegian "Grammy"), and a variety of top international artists. Hopefully, I can show you a photo of Oslo Spektrum later. Today I replace the photo with this banner, to help make the world aware of the serious illness ME/CFS (Myalgic Encephalomyelitis/Chronic Fatigue Syndrome). I have had this illness for the past 8 years, and it took 7 years to get a diagnosis. My hope is that if more people are aware of the illness, it will help others get a diagnosis sooner - and thus help them recover quicker. The longer it takes, the greater is the chance of it becoming chronic. Some think this is a new illness, but it probably goes back many centuries. They even think that Florence Nightingale had ME/CFS. Myalgic Encephalomyelitis (ME) is a neurological disease, assumed to be triggered by virus infection (WHO ICD-10, code G93.3). The major symptoms are neurological, immunological and neurocognitive in nature. In addition a rapid and debilitating fatigability of muscles and brain is present. The cause of ME is not yet known. Myalgic Encephalomyelitis is most often triggered by a viral infection. Other triggers are noted to be anesthesia, vaccination and stress. After a viral infection, the patient does not recover as normal and quite many new symptoms, neurological, immunological and neurocognitive, develope. Additionally, a rapid fatiguability of muscles and brain is present, and restitution is abnormally prolonged. Symptoms in Myalgisk Encephalomyelitis (ME) are multifarious, which can be expected because of the involvement of the central nervous system (CNS). The symptoms include infections, problems in muscles and joints as well as neurological and neuropsychological problems. Varying and fluctuating symptoms during the day, but also in the course of days, weeks and months. Please visit ME-Site to read more about ME/CFS. This is another view from Carl Berner in Oslo towards the center of town, the fjord and the city hall. Notice the red and the yellow wooden building in front? 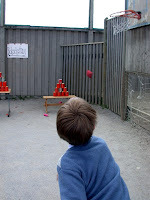 Today's photo was taken by my guest blogger, Stormel, who is both my neighbour and friend. This is the view from her window at work. Very impressive, isn't it!? 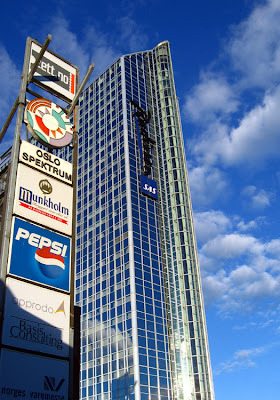 This is the hotel Oslo Plaza. With it's 129 meters tall (approx. 423 feet) it is the tallest hotel in Northern Europe and Norway's tallest building. There are 37 floors and 673 rooms in this hotel. I have no idea about the prizes as I've never stayed there myself, but I did go to the bar on the top by the glass elevator outside of the building. Very cool! This is where the jumpers land after floating on air for quite a while. Of course, in the winter there's snow here and no water. In the summertime this place is used for concerts and games. Click on photos for lager image. Yesterday, as I was driving I suddenly realized I was one hour early for my appointment. Okay, time to be a tourist! So I decided to visit Holmenkollen. 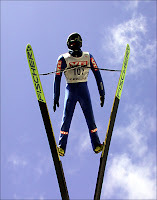 Holmenkollen is a world famous ski jump. It was built in 1892, but has been rebuilt several times since then. Unfortunately, it is now decided they will tear it down (but rebuild it again). It's not modern enough for the jumping competitions. 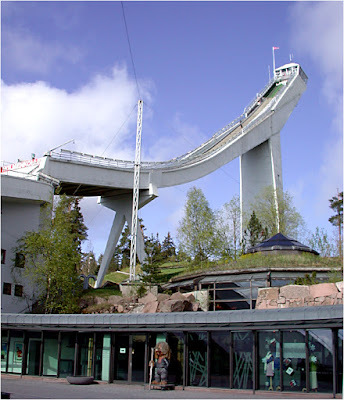 Holmenkollen is one of the most visited tourist attractions in Norway. You can actually enter the tower/room at the top. I bet the view is awesome from there, but I've never tried it. 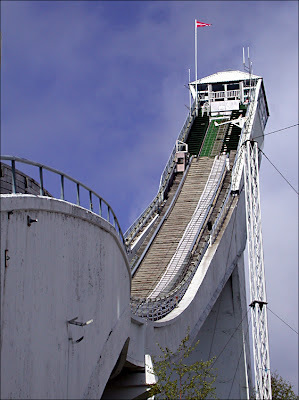 The ski jump is situated in a hilly area, so you can see most of Oslo from there. This means that a lot of the inhabitants of Oslo have a view to the ski jump, me included. I will add more photos tomorrow. This used to be the wheel house on a Norwegian fishing boat. Now it's a very unique coffee-hut situated on Røa (a part of Oslo towards the west). The owners are a couple, where he is from Alaska and she is from Sweden. Why they ended up in Oslo, I don't know, but I sure am happy for it! They sell really good coffee, which is a nice change from the disgusting drink you get from the vending machines at 7-Eleven and similar places. Earl (the owner) told me that he didn't like the coffee he got here so he decided to import a coffee of his taste and sell it to us. 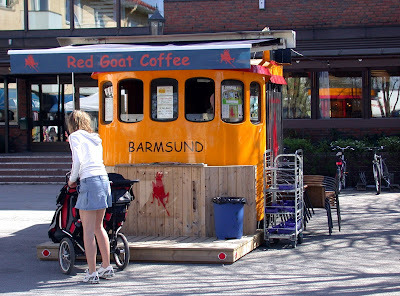 The Red Goat is shipped from Alaska on the same day it's roasted. That way it's really fresh when it arrives here, and there's a lot of taste. I really don't understand how they can grow coffee in Alaska, but I'm sure there is an explanation. I will try to find out. That's a good excuse for me to go there again. Another great thing they have done to this area is putting up benches and café tables. The market square used to be empty and wind-swept. Now it's crowded and wind-swept, which is a whole lot better. I go there sometimes in the morning, buy my coffee (latte) and sit there looking at people or chat with some of the employees in the different shops there. This photo is taken on the top of Carl Berner, which is situated quite close to the center of Oslo. Far off to the right you can see the top of the two towers of the City Hall. You also see the inner parts of the Oslo fjord and parts of the tiny islands I wrote about in an earlier post. 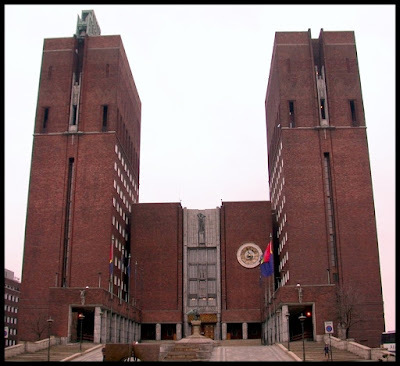 Yesterday I showed you a photo of the Oslo City Hall. Today I'd like to show you some details from and around the building. This is one of several wall decorations. This one showing a happy couple skating on the ice and a couple of fishermen. Hmm, I don't know what to say about that... :-) This next photo shows the tile decoration on the ground around the city hall. The area is very popular for skaters using the stairs and the fountains as their playground. The Oslo City Hall houses the City Council, City administration, and art studios and galleries. The construction started in 1931, but was paused by the outbreak of World War II, before the official inauguration in 1950. 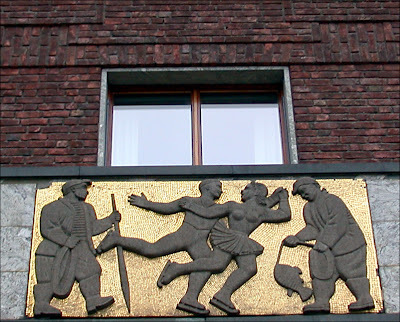 Its characteristic architecture, artworks, and the Nobel Peace Prize makes it one of Oslo's most famous buildings. 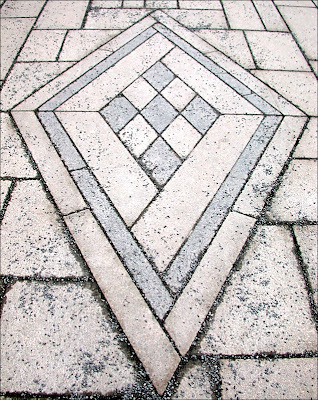 It was designed by Arnstein Arneberg and Magnus Poulsson. 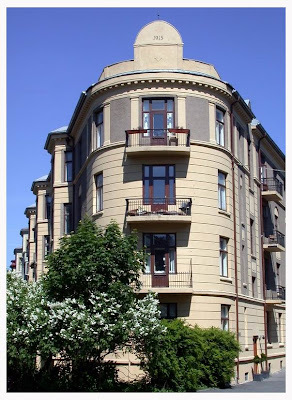 It is situated in Pipervika in central downtown Oslo. The area was completely renovated and rebuilt to make room for the new City Hall, back in the late 1920's. Today's photos are taken from my balcony. 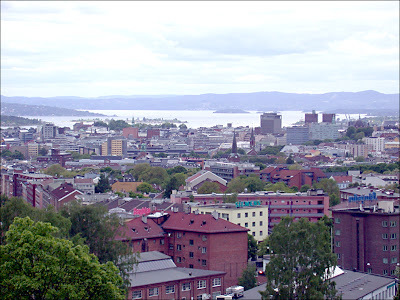 The view is towards the center of Oslo and of the Oslo fiord. As you can see the spring has done wonders to the nature, it's green everywhere. Very lovely, after a long, cold winter. The second photo is a closer look at the harbour area, showing furthest to the left the Oslo City Hall (the brown, square building). You can also see the small islands right outside the harbour. There are ferries going to and from these islands. On some you can only visit during daytime, but on others there are small cottages where people live during spring/summer. My grandparents had a cottage on one of these islands. Only 10 minutes by ferry and we were in paradise. These days you have to be a millionaire to get a cottage here, but in the beginning (early 1900, I think) they were put there to create summer homes for the working class people. Normally these people could not afford going away in the holidays, but not they had a great place where the family could live from Easter to Autumn. Click on the photos to see bigger format. I'm sorry about the quality, this camera doesn't have a good zoom. 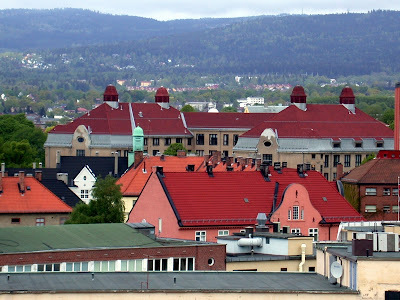 A lot of people who don't know Oslo very well, only think of the city center as Oslo. But the city is so much more. Most inhabitants live in the suburbs, which can often be compared to smaller towns. I live in one of these suburbs and sometimes feel like a small town citizen when I see familiar faces everytime I go to the grocer's shop or visit other places in this area. This photo shows something typical for the suburbs. 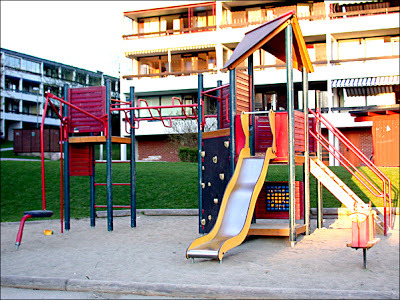 The blocks of flats surround small squares where you can find a playground and a place to rest for the parents. 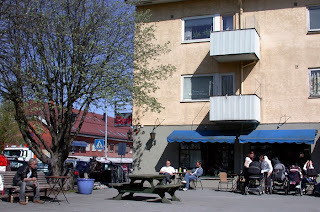 Some places offer a place to barbeque, so the people living here can meet neighbours and enjoy themselves in the long summer evenings. 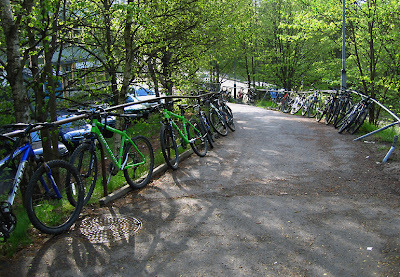 As this photo shows, a sitting arrangement can be combined with a shed to park the bikes.